La Casa Blu pub is cozy inside and on one of the coziest places of Prague! 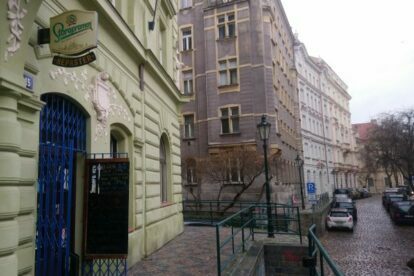 On a street corner like from the old times, in the heart of Jewish town, very close to all the attractive sites of the city, is a bar founded by Prague Chilean Jorge Zúñiga and is called the ‘Hispanic’ pub, café and bar. You can expect a welcoming environment inside and I can remember several different moods the bar had: nicely smelling lunch time, offering its tasty fusion of Tex-Mex and Latin cuisine; lazy summer afternoons with chilling cocktails; a totally busy night where crossing 10 meters from one side of the bar to another took an hour, because the motion characterized by the situation was more of a Brownian motion than a walk; I am looking forward to hearing about your experience! When visiting, enjoy the food – soups, nachos, salads, tacos, burritos, sandwiches, quesadillas and other delicious meals. As for drinks, your will get anything you wish, starting with coffee, beer, vine, a wide variety of spirits and last but not least, cocktails. Spanish-speaking visitors will be pleased by the Spanish-speaking bartenders. I met at least one every time I spent one warming moment there.